Of Interest: This high-resolution enhanced color view of Kuiper crater shows not just the bright rays that extend out from this relatively young crater but also the redder color of Kuiper's ejecta blanket. The redder color may be due to a compositionally distinct material excavated from depth by the impact that formed Kuiper. This image was acquired as a high-resolution targeted observation. Targeted observations are images of a small area on Mercury's surface at resolutions much higher than the 250-meter/pixel (820 feet/pixel) morphology base map or the 1-kilometer/pixel (0.6 miles/pixel) color base map. 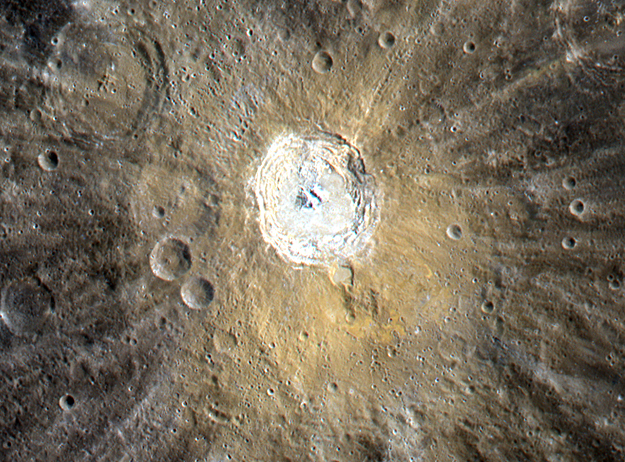 It is not possible to cover all of Mercury's surface at this high resolution during MESSENGER's one-year mission, but several areas of high scientific interest are generally imaged in this mode each week.